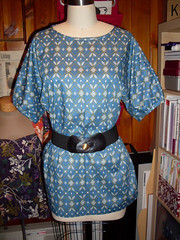 I sewed up this tunic in a couple of hours yesterday using the Anna Maria Horner voile I bought the other day. I used the same Cynthia Rowley Simplicity 2472 pattern that I used for this dress. I love the diamond motif on this fabric, so retro and fun! hey! i was just google-ing this patten because i was thinking of making it for a school project but it has to be in a woven fabric. would you suggest using a non-knit fabric for this? Actually the fabric I made this tunic from was a woven. It sews up very fast!